Though the art scene dwindles as summer encroaches on New York, Rain Room (2012) and the larger EXPO 1: New York reinvigorated an otherwise lackluster season. Rain Room was the centerpiece in MoMA’s larger EXPO 1: New York, exhibited in Midtown Manhattan, with associated exhibits at MoMA PS1 in Long Island City and the VW Dome 2 in Rockaway. Though the elements of MoMA PS1’s EXPO 1: New York could at times appear disparate, the multifaceted exhibit unleashed an array of ideas that was informative without being pedantic, melancholic yet not burdensome. At MoMA PS1, the intricate, yet loose, narrative provided viewers with the means to interpret our environmental challenges and the potential solution. EXPO 1‘s core message was that climate change is a reality that can no longer be ignored. Viewers were directly confronted by our future of flooding, rising sea levels, and species extinction in Olafur Eliasson’s Your Waste of Time. Composed of ice slabs melted off of Vatnajökull, Iceland’s largest glacier, Eliasson stunned an audience dissociated by smartphones, social media, and sheer distance by importing the climate change’s devastation into the museum. While MoMA PS1 housed a wide array of creatively curated environments, Rain Room was the only feature in Midtown Manhattan. The immersive environment was created by rAndom International, the collaborative studio of Hannes Koch (German, b. 1975), Florian Ortkrass (German, b.1975) and formerly Stuart Wood (United Kingdom, b. 1980). rAndom International’s contribution to EXPO 1 obtained a soaring supply of national attention, propagated by millennial’s proclivity to social media and the installation’s novelty. Through technological innovation, Rain Room provided the experience of walking amid a storm except water miraculously never touches the body. While Rain Room gained great notoriety for its ingenuity, what attracted massive headlines were the enormous lines that formed, early each morning, to experience the work for the allotted ten minutes. The New York Times reported that average wait for MoMA non-members was four to five hours while members waited two to three hours to experience Rain Room. Social Media outlets such as Instagram, Twitter, Facebook, and Flickr functioned as mass-marketing tools, increasing the exposure of the environment through the hashtag #EXPO1. While Rain Room was enveloped by a haze of anticipation and subsequent overexposure, the issue at hand, which I grappled with upon experiencing the work for myself, was whether or not Rain Room was indeed a merit-worthy work of art in the context of EXPO 1: New York. To answer this question, we must look back to Allan Kaprow, the pioneer of art as environment. Kaprow’s environments broke down the barriers of art and life, facilitating a full body, multisensory experience. Though Kaprow’s environments were elaborate, fundamentally they were rooted in everyday objects which a viewer rediscovered in an entirely new light. Around half a century after Kaprow’s introductory environments, MoMA exhibited Rain Room. In comparing Kaprow’s vision and Rain Room’s actuality, it is the inclusion of technology that allowed Rain Room to simulate a natural experience. Whereas Allan Kaprow explored the fluidity between art and life, rAndom International appeared to solely parade their ability to master technology in an intriguing way. Kaprow’s environments make it clear that Rain Room, just like everything else, can be viewed as art. What separates quality environments from nonsense is the experience provided to the viewer. My 10 minutes in Rain Room commenced with the pounding sound of pouring rain. Upon walking through Rain Room, I did remain mostly dry. Though rAndom International could not entirely perfect their environment, the aftermath of walking through the pouring rain was that of a mid-afternoon sunshower. However, what was fascinating about Rain Room was the reaction of my fellow spectators. Locked behind the screens of their smartphones, I overheard simplistic statements like, “how did they do this?” or, “I need an Instagram!” This was captivating in contrast to what I experienced on MoMA’s 5th floor, where I have observed onlookers stagger at the similitude of Braque and Picasso and weep in the presence of Monet’s Water Lilies. The distinction between the reactions to Rain Room and those experienced elsewhere within MoMA can be attributed to depth. Rain Room lacked depth. To answer the question “how did they do this?” The answer, in the simplest of terms, is money. The three-dimensional sensor cameras used by rAndom International came from multiple investors who had faith in the firm’s technological capabilities. Rain Room was a testament to the awe-inspiring potential for technology, a conclusion I could have reached during an expedition to Brookstone. 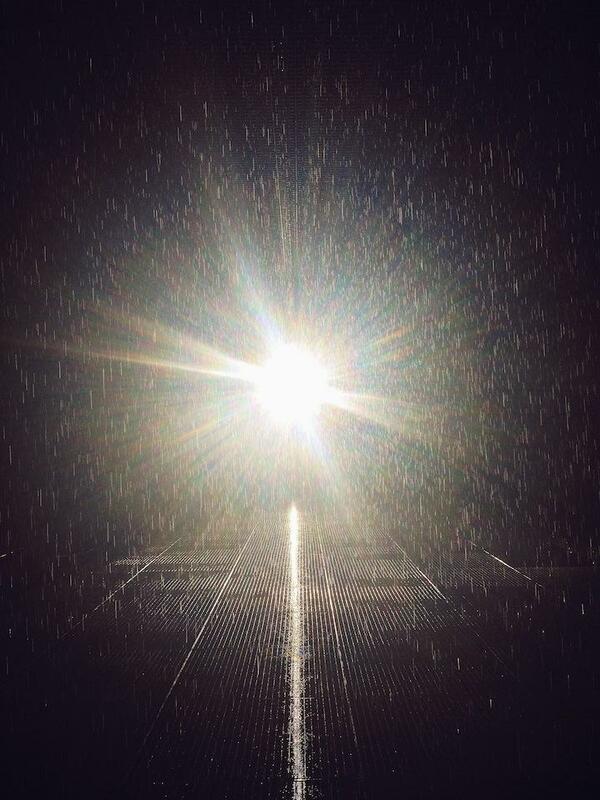 I believe the core issue I had with Rain Room was the role it played within the larger exhibit of EXPO 1: New York. Rain Room invited viewers to contemplate the role that technology could play to preserve the global environment, but the ten minutes allotted to each visitor was spent doing just the opposite. Viewers could not discern the impact of EXPO 1‘s dark optimism because they were busy polishing their latest Instagram posts, considering their impact on the virtual environment that absorbs our attention. Viewing Rain Room not as a work of art but as a component of the narrative of dark optimism, it becomes apparent that the Rain Room‘s intimation may similarly be called into question. How will the technology that created Rain Room alleviate the global environmental crisis? Rain Room’s motion sensors fail to address environmental challenges and unmask the work as a multi-million dollar gimmick. While the rest of EXPO 1: New York forcefully contemplated momentous global challenges, Rain Room seemed like a ploy to draw viewers into EXPO 1: New York‘s larger platform. The 21st century has propagated the coalescence of art, technology, and commodification. As technology grows ever more potent and innovative, it may be in the spirit of Allan Kaprow for technology to mingle with art. While EXPO 1: New York was highly indicative of this potential evolution, Rain Room conversely validates the toxic affiliation between money and art. While art is not explicitly defined by money, contemporary art has increasingly gestures towards the contrary. Art commentary is permeated by discussions of value, worth, and investment. Rain Room demonstrates that sufficient funds could finance even the most outlandish possibilities. As the publicity and anticipation towards Rain Room fade, it remains beneficial to contemplate the role that Rain Room played in the conversation around global warming, the desire for museums to provide blockbuster Instagrams for their audience, and the greater narrative of contemporary art. Ultimately, I believe that Rain Room revealed that a multisensory experience does not need to have any greater signification. A novel experience can be nothing more than that. And yet, as an aspiring art historian, I found it to be problematic that I left Rain Room with just one thought: it rained on me. 1: “EXPO 1: New York,” MoMA PS1, accessed January 30, 2014, http://www.momaps1.org/expo1/module/dark-optimism/. 3: Julie L. Belcove, “Steamy Wait Before a Walk in a Museum’s Rain,” The New York Times (New York, NY), July 17, 2013, Arts, accessed January 30, 2014, http://www.nytimes.com/2013/07/18/arts/steamy-wait-before-a-walk-in-a-museums-rain.html?_r=2&amp;. Belcove, Julie L. “Steamy Wait Before a Walk in a Museum’s Rain.” The New York Times (New York, NY), July 17, 2013, Arts. Accessed January 30, 2014. http://www.nytimes.com/2013/07/18/arts/steamy-wait-before-a-walk-in-a-museums-rain.html?_r=2&amp;. MoMA PS1. “EXPO 1: New York.” MoMA PS1. Accessed January 30, 2014. http://www.momaps1.org/expo1/module/dark-optimism/. The Museum of Modern Art. “Rain Room.” MoMA. Last modified 2014. Accessed January 30, 2014. http://www.moma.org/visit/calendar/exhibitions/1380.